Situated south of Glasgow, Hamilton Park Racecourse can be easily accessed via the M74 north and south and represents one of the great Scottish traditions in Horseracing. Although the current course opened in 1926, there has been racing in Hamilton dating back to 1782 and Hamilton Park races have proved popular ever since. Noted for combining excellent flat racing with superb entertainment and hospitality, Hamilton Park has established itself as a premier Scottish horseracing venue. The importance of Hamilton Park to the history and culture of horseracing was cemented in 1947 when it was the first racecourse to introduce evening fixtures and latterly in 1971 when another first saw Hamilton Park host a morning race meeting. Evening meetings remain the most popular fixtures at Hamilton and there are 7 hosted throughout the season, the most significant being the Saints and Sinners Charity Meeting, held in June. Evening fixtures combine with live entertainment for a great evening out and they are real highlights for casual racegoers who like to mix the thrill and fun of the races with some lively social interaction. The highlight of the flat season at Hamilton for the racing purists is the Glasgow Stakes, a Listed race for three-year old colts and geldings. Sometimes serving as a trial run for the Epsom Derby, Commander in Chief won both in 1993. The track at Hamilton Park Races has a 6 furlong straight with an uphill finish, favouring horses with real stamina and making for terrifically exciting finishes. 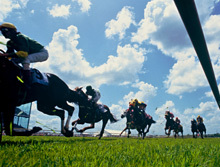 Longer races incorporate a right handed loop, in a similar layout to that of Goodwood and with soft going generally a feature at the start of the season high draws are favoured over the longer distances. Southern trainers tend to do well at Hamilton. During the most popular meetings racegoers to Hamilton have two enclosures to choose from, the Club enclosure and Grandstand Enclosure. Club badge holders get the best views of the course and can stand right at the winning post for the exciting finishes on the uphill straight for which the course is so renowned. Those within the Club Enclosure can also access the Champagne Bar and Dukes Restaurant. One hour before the first race a tipster will be on hand in Dukes Bar for all the betting advice you will need for the day. Club badge holders can also access the Grandstand Enclosure or guests can opt for tickets to this enclosure on its own. Within the Grandstand there is a family friendly restaurant, the Conservatory Bistro, good views over the track, and badge holders can access the Paddock Lawn facilities which include an open barbecue during the Super Six meetings. A children’s play area is open at all fixtures and the Grandstand Enclosure is perfect for a family day out at the races. 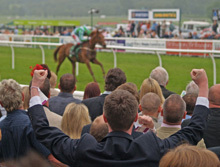 Betting options for racegoers at Hamilton Park Races include the Totesport Betting shop which is just like any high street bookmakers, the bookmakers’ ring which defines the excitement of betting for many as they peruse the odds offered by each bookmaker, and at a Totepool Kiosk. These offer a range of betting options including a popular placepot bet where you can place a bet for all the races and follow your progress throughout the day. Totepool kiosks are ideal for the casual racegoer and will offer a friendly service and betting options. There are many dining and drinks outlets within the racecourse whether for a casual informal snack or a high end dining experience in the classic raceday style. Dukes Restaurant within the Club Enclosure offers great dining in an elegant environment, perfect for small groups, and also has superb panoramic views over all the racing. Bookings for Dukes Restaurant must be made at least a week in advance. Drinks options include Dukes, the Silks, and Brandon Bars, each with its own special appeal. The main dining facility within the Grandstand Enclosure is the Conservatory Bistro and bars include the Panorama Bar, which has great viewing and betting facilities, Bravehearts, the bar of choice between the races for many, and Cats Bar, which offers a range of sandwiches and snacks. A great way to enjoy the summer sunshine and avoid the queues at the main bars is to access the Paddock Lawn, which has seating areas, open air barbecue, and bottle bars. Tickets may be bought in advance for all 19 race meetings. A full selection of race day packages and hospitality options are available for those who want a comprehensive race day experience. Discounts are available for groups of 20 or more and the perfect solution for a group of at least 6 people is the 5 Star package which comprises admission badge, racing guide, official race programme, a pint of beer of glass of wine, an item from the barbecue, and a Tote voucher. Race day conferences can even be organised and a series of settings from private boxes to chalets and marquees offer a range of environments suitable for first class corporate days out or simply enjoying a celebration with friends or family. Packages will incorporate all tickets, race programmes, and dining whether a stand up buffet or full three-course meal with champagne. Additional features of corporate hospitality options include a private bar and CCTV screens showing all the races. Contact Hamilton Park to discover the best package for your requirements.